Sony (s SNE) could be the latest company to try taking on the cable industry with an over-the-top video service. 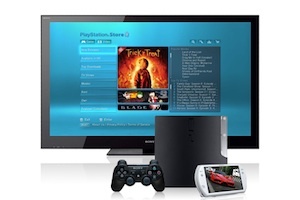 According to The Wall Street Journal, (s nws) the consumer electronics manufacturer is in talks with media companies about launching a TV-like service that would be delivered to its PlayStation 3 game console and other connected devices. Sony has approached multiple media companies about the proposal, which would create a bundle of TV channels that would be streamed into consumers’ homes. The idea is to create an Internet-based alternative to pay TV services offered up by existing cable and satellite companies, with potentially lower prices and more flexibility for consumers. In some ways, the offer would make sense: Sony already has a huge potential customer base, as it would offer the service through various devices such as its Internet-connected TVs, Blu-ray players and the PlayStation 3. The PS3, in particular, is particularly interesting: The device has sold more than 18 million units in the U.S., and already has a huge number of users streaming videos from services like Netflix (s NFLX) and Hulu Plus. Cable, satellite and IPTV providers are already under pressure due to increasing prices and a weak economy. The number of new subscribers in the U.S. has largely been flat over the last few years, as consumers have bought fewer new homes and have been forced to think twice about discretionary spending. At the same time, over-the-top video services are growing dramatically. Despite a loss of subscribers due to a pricing change earlier this year, Netflix still had 40 percent more subscribers at the end of the third quarter than a year ago. And services like Hulu Plus and Amazon Prime Videos (s AMZN) also seem to be taking off. If history is any guide, however, Sony is unlikely to succeed in its efforts to propose an over-the-top alternative to cable. Multiple device makers over the last few years have attempted to build TV-like bundles of content to be distributed over the Internet, including both Microsoft (s MSFT) and Apple. (s AAPL) Despite having large numbers of rabid customers, both were unable to convince big media companies to get on board. The main issue for media companies is the potential of alienating their existing distributors and reducing viewership through traditional distribution models. Digital distribution is providing some incremental dollars to media companies for library or long-tail content, but they’re afraid over-the-top services could cannibalize their existing viewership and revenues. So while Sony — like Microsoft and Apple before it — is most likely interested in a streaming linear TV offering, it wouldn’t be surprising to see it roll out a subscription video-on-demand service like Netflix or Amazon Prime Videos instead.